They were the pirates of the open seas — bringing rock and pop music to a new generation. William note that this story can be found on multiple news sources, but the ABC has more photos. Many thanks for the tips, William! Like many Post readers, I do love Radio Caroline! This entry was posted in News, Nostalgia, Pirate Radio, Radio History and tagged MV Ross Revenge, Pirate Radio, Radio Caroline, Radio Caroline 50th Anniversary, William Lee on August 13, 2017 by Thomas. over the planet, an iconic face of freedom of expression. Good set of related links at Mr. Lister’s web page above. An online museum devoted to recording and preserving the world-wide history of offshore radio and television broadcasting. Fifty years ago Scotland’s own offshore pirate radio station closed down, bringing to an end a radio revolution which captured the hearts of millions. “Radio Scotland” was the brainchild of Tommy Shields, a former PR man with STV who ran his own advertising agency. In the summer of 1965, inspired by pirate pioneers such as Radio Caroline and Radio London, Shields purchased a former Irish lightship, the Comet, for £7,000 – and spent about three times as much adapting the vessel for use as a floating radio station. ….When they were back on land the disc-jockeys made personality appearances at the Radio Scotland “Clan Balls” around the country – in venues like Glasgow’s Locarno, McGoos in Edinburgh and the ice rinks at Inverness and Ayr. These became the Scottish showcase for major British groups of the sixties such as The Kinks, The Troggs, The Searchers, The Animals and Manfred Mann…..
Six years later [after closure of “Radio Scotland”] Radio Clyde was launched as Scotland’s first licensed independent radio station – the same night the BBC, rather cheekily, rebranded their Scottish Radio 4 opt-out service “Radio Scotland”. ….Radio 270 was a roomful of electronics in the former fish hold of a 1939 Dutch lugger called Oceaan-7, operated for 15 months by Wilf Proudfoot, a Scarborough supermarket owner and Conservative politician. He had been an MP in the early 1960s and would be again a decade later. Its disc jockeys included the future BBC presenters Philip Hayton and Paul Burnett, as well as two Australians who styled themselves as Neddy Noel and Dennis the Menace. Radio 270’s signal could be heard across Yorkshire and as far south as Nottingham and Derby. “It was a very small boat, the smallest of all the radio ships,” said Mr Rusling, who later worked on board Radio Caroline. …. What followed has been 50 years, on and off, of unpredictable radio from Caroline, most recently operating online at radiocaroline.co.uk. Amazingly, after all these years of fighting for survival, Radio Caroline has, at last, been recognised as a legitimate broadcaster, licenced by Ofcom, and soon to resume serving the Clacton area and beyond on 648kHz, medium wave. After a 50-year struggle you might wonder why a licence wasn’t granted in 1967, just as millions of listeners wanted. You can celebrate Caroline’s achievements this Sunday, August 13, at a special event to be held at the Princes Theatre, Clacton. link it to a Harwich light-ship hosting a pirate broadcast for 3 DAYS, THIS WEEKEND! THE last BBC Essex pirate radio show will be aired in a special three-day broadcast in Harwich. The town will be awash with former radio pirates who revolutionised popular music in the 1960s from Saturday August 12, to Monday, August 14. BBC Essex will be broadcasting live from the LV18, the last manned lightship, at Harwich quay. Ray Clark will be broadcasting from the ship on Saturday and Liana Bridges, along with former Radio Caroline pirate Barry Lewis on Sunday at 9am. Keith Skues will be on air on Sunday night for a three-hour regional show with guest Roger “Twiggy” Day. The LV18 studio will be live from 9am to 3pm on Monday to mark the 50th anniversary of the Marine Offences Act, which shut down all but one pirate radio station in 1967. Tony O’Neill, from the Pharos Trust, which owns the red lightship, said: “The BBC and Pharos Trust will also being hosting an exhibition of pirate radio memorabilia on the Ha’Penny Pier over the three days. “The exhibition will include recently discovered and unique photographs from 50 years ago of the pirate radio ships Galaxy and Mi Amigo. 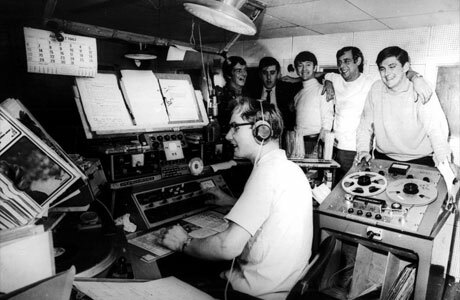 On Monday the ashes of the late Dave Cash, a 1960s radio pirate and BBC presenter will be scattered from Harwich Lifeboat by his widow Sara Cash. Those wanting to pay their respects should gather on Ha’Penny Pier from 10.30am. Bill Rollins Teatime Pirate Radio Special was excellent yesterday on the 2NG broadcast from WBCQ. It, and this article, helped me better understand what transpired in the U.K. at the time. Luckily for me, I had The Big 8 CKLW pouring into NW Ohio to listen during the day. At night, WCFL & WLS both out of Chicago, filled my room with music. So it only took 50 years but Radio Caroline now has a full time _legal_ transmitter now. They’ve bagged themselves a local AM license. Some how I just don’t think it’ll be the same?